I teach 1st grade at a fabulous school in Albuquerque, New Mexico. This is my 9th year at my school and my 18th year teaching. Prior to teaching in Albuquerque, I worked in a variety of educational settings in California and Washington. I took several years off to stay at home with our two boys, John and Mark. During that time, I wrote curriculum and learned a lot about early childhood. When I was ready to go back to work in the classroom, I knew I wanted to focus on early childhood education. I have a Bachelor’s Degree in Elementary Education, a Master’s Degree in Curriculum, Teaching & Learning with an emphasis in Reading & Language Development, and dual certification in elementary education and special education. A few years ago, I achieved National Board Certification in the area of Early/Middle Childhood Literacy. Teaching children how to read and write has always been my passion, and I’m especially interested in early literacy curriculum development. I’ve been married to my husband Cael for 18 years. My husband imports fair trade baskets from Africa. He supports thousands of African basket weavers and provides them with a sustainable income. Here’s a link to his company, Baskets of Africa. John is a junior in high school. This summer he and I will spend several weeks looking at colleges on the East coast on and in Colorado. Mark is a freshman who is interested in flying and engineering. He has a summer full of related activities planned. We enjoy traveling and frequently go to Mexico. My parents live in central Mexico, and we visit them whenever we can. We had an awesome Make-a-Wish trip to Washington, DC in March. 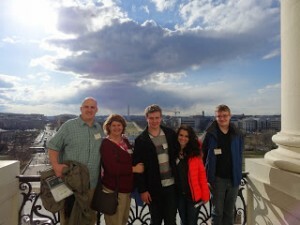 Here’s a picture taken from the balcony of the Capitol Building.